So… by now you have either consumed every single episode of the new Netflix Daredevil series, took the day off work so you could watch the entire series, or at least have watched one or two episodes of the series. 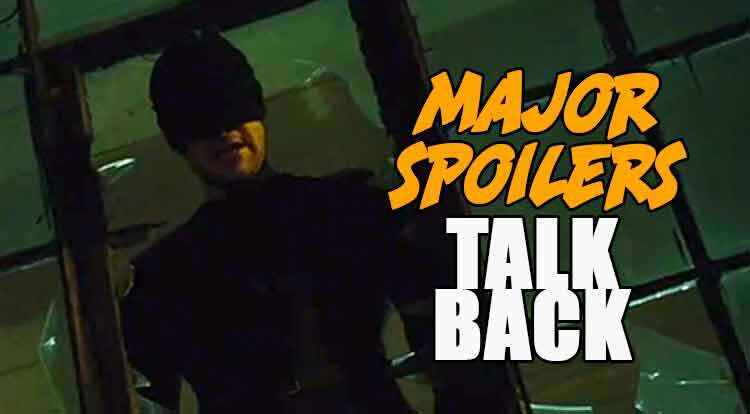 Use the comment section below to share your thoughts about the series, and feel free to point out all the hidden Marvel references and bits of goodness (and badness) that you saw. I just finished the fourth episode, and the only reason I don’t continue with the next one straight away is that I don’t have any more time if I want to sleep before I meet my friends for a convention tomorrow. I really enjoy the series, very much so. – The fight scenes are very enjoyable. The show doesn’t rely on fast cuts and punch punch punch, there are some really nice long shots in there with a more acrobatic and imaginative fight choreography. – There have been some really nice scenography and cinematography in the series in the first couple of episodes, I particularly enjoyed a scene in Matt Murdock’s apartment in the first episode and the last scene of the second. – The show is REALLY violent, some times shockingly so. This is not necessarily a bad thing, but you may want to beware if you have young children or generally do not appreciate the implication of some pretty horrible acts of violence. Feels like Jason Bourne meets Marvel and it is fantastic! Three episodes in and Im loving it! Action looks good, casting and acting is some of the best I’ve seen in a while and plot seems to developing in interesting way. Update: Just finished the whole thing and I think its safe to say this is my all time favorite superhero TV show. I have faith this does well enough for at least season two. I was kinda shocked that they killed an important Daredevil character in this one, though. I’m five episodes in and so far everything is fantastic. What really got me was Fisk. I was not prepared to be as terrified of the Kingpin as I am, nor like him as much as I do after seeing him be awkward on a date. This show really is incredible. 2.5 episodes in (going to rewatch the third later when people aren’t being annoying here) and so far I’m enjoying it. I thought the casting so far has been superb. Feels a bit like watching “Arrow” at parts, but not so much that it feels like a copycat. Don’t have any major complaints yet. Binge watched the whole thing. Loved it. Not anywhere near as grimdark as people were projecting. Some minor inconsistent acting on the part of Deborah Ann Woll and Vincent D’Onofrio, but that felt more like they shot the entire series out of sequence and they hadn’t fully developed their character. They got it right during the important scenes. I have not finished yet, but it is a really good show. Makes me really excited to see the next one with Purple Man! Two major important things for me – one, they get the Foggy and Matt relationship right. Foggy is brilliant, you get a performance that sees the best of the character – he is genuinely fun and genuinely genuine, and you can really see why he’s been such a support for Matt Murdock in the history of the comics. Two, while the violence is one thing, what really matters to me is the characters KEEP the injuries. And it’s shown that being stabbed once episode actually has him needing to be careful in the next. He doesn’t go out, get beaten, and miraculously become okay once he takes off his mask. You really feel the stakes there – you actually feel his life is at risk every time he takes a punch, a risk that’s doubled when a thug brings out a knife, or even a lead pipe. There’s violence, yes, but this is the first time in visual media I actually feel like it’s violence that has weight to it. Oh, a third thing – I really like how crime is set up in Hell’s Kitchen. You can really see a dark organized underground kingdom taking shape. It’s brilliant crime storytelling. Although I’m only 4 episodes in. I like it, a lot. Vincent D’Onofrio totally knocks it outta the park as Kingpin. Perhaps the best thing yet to come out of the MCU. And was I the only one who checked IMDB, to figure out whether or not, the newspaper editor (Ellison) was played by Ed Brubaker? What?! Brubaker showed up in The Winter Soldier.. it could have been him.. Turns out it was just Geoffrey Cantor in beard and glasses.